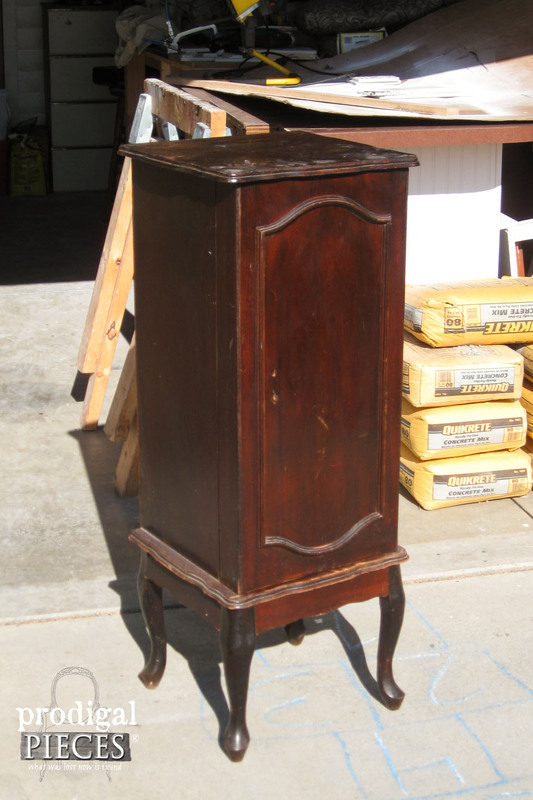 Turns out the guy sold the nightstand before I got there (me not happy at all), and he had a bunch of other stuff that he kept trying to sell me. He said that he and his wife “shabby chic” stuff and asked if I did the same. ummm… (wink, wink). Anyhoo, I was upset I wasted my time and didn’t want to come away empty-handed for my effort, so I bought this thing. meh. I wasn’t too keen on working on it because it looked like a whole lotta work, but thought I’d give it a try, and if I didn’t want it I knew one of my kids would like to have a crack at it. To me, it looked like a blank slate and since I have yet to add a piece like this to my repertoire, so I thought I’d have a try. To get started, I removed all the damaged velour, and made repairs. 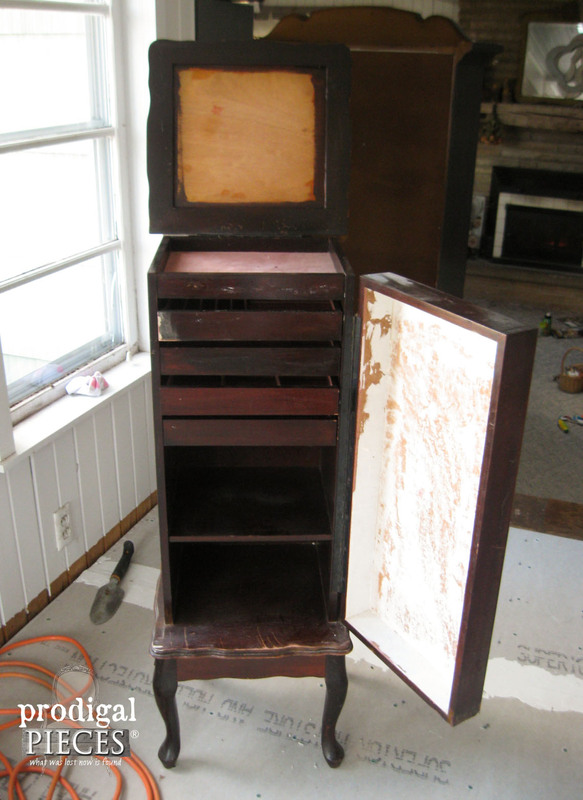 Then I primed like crazy with Kilz because this was a mahogany stain that would bleed through. Bleeding isn’t an issue if you’re using a deep dark paint, but I intended to go light on this one. 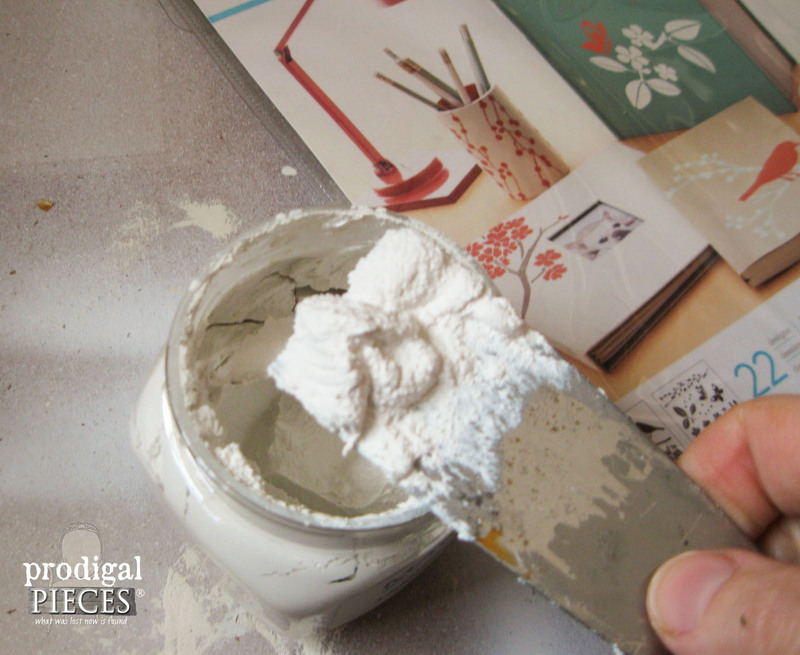 Once primed, I did two coats of my favorite Antique White by Behr using a Glidden Flat Paint. 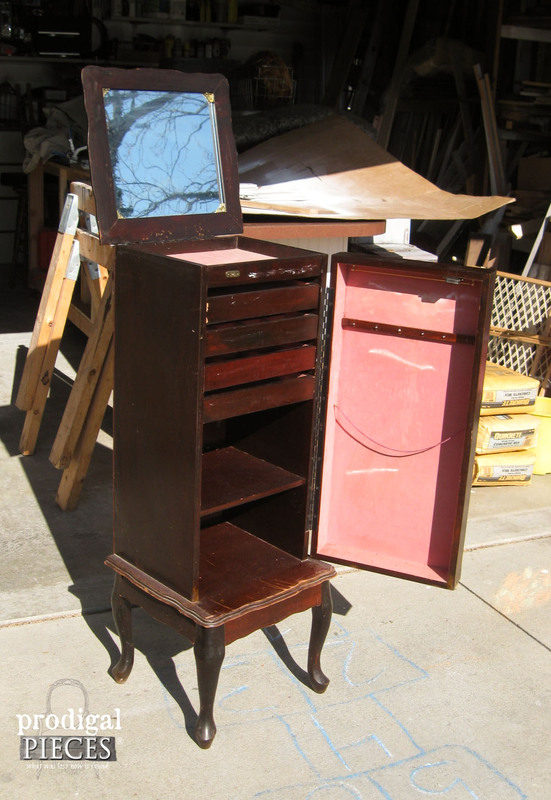 I’ve used this same color oodles of times, like on my chest of drawers and this dressing table and this French beauty. 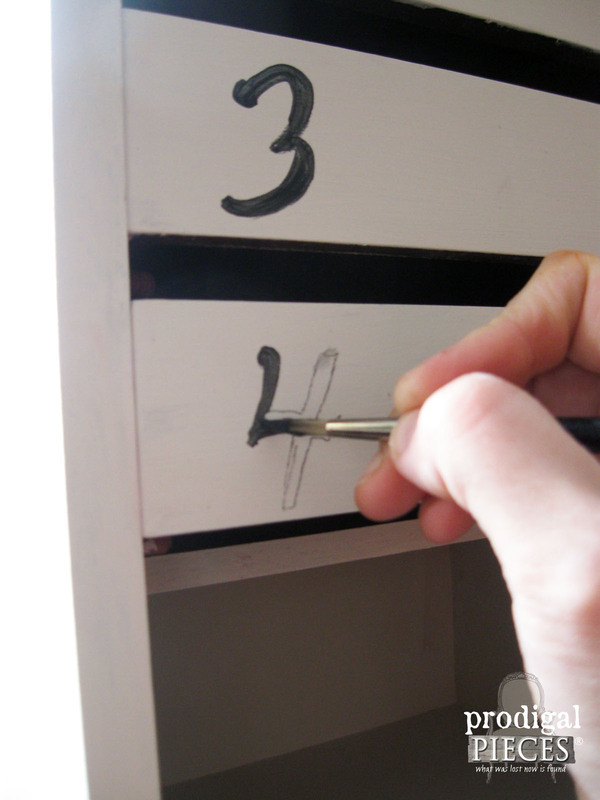 Once the paint was dry, I hand-painted the drawer fronts to create some whimsy. 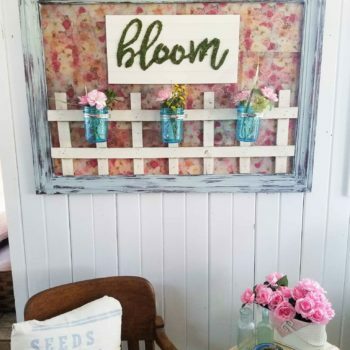 My original intent was to hand-paint a floral design to the front because to me it was like a canvas, but I really didn’t want to add any color. It just needed something, so I decided to emboss the front panel. 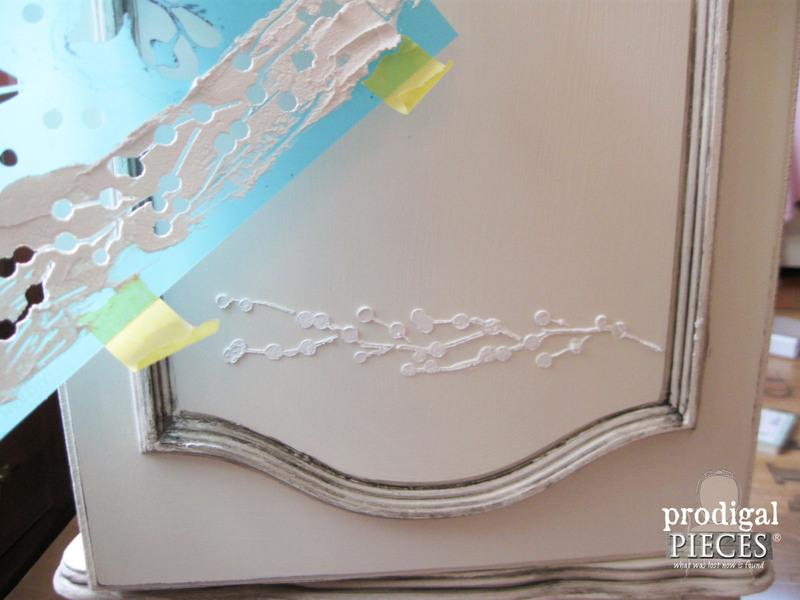 Hint: You could also use embossed wallpaper like I did on this nightstand for a simple effect too. I typically use spackling for a smooth finish, but when I went to work on my project I found my tub dried up. tsk. So, because I have been under-the-weather, I wasn’t about to go anywhere and used what I had on hand instead – a specialty finish by Martha Stewart. It’s a bit more grainy, but I like the effect too. Let’s get started. 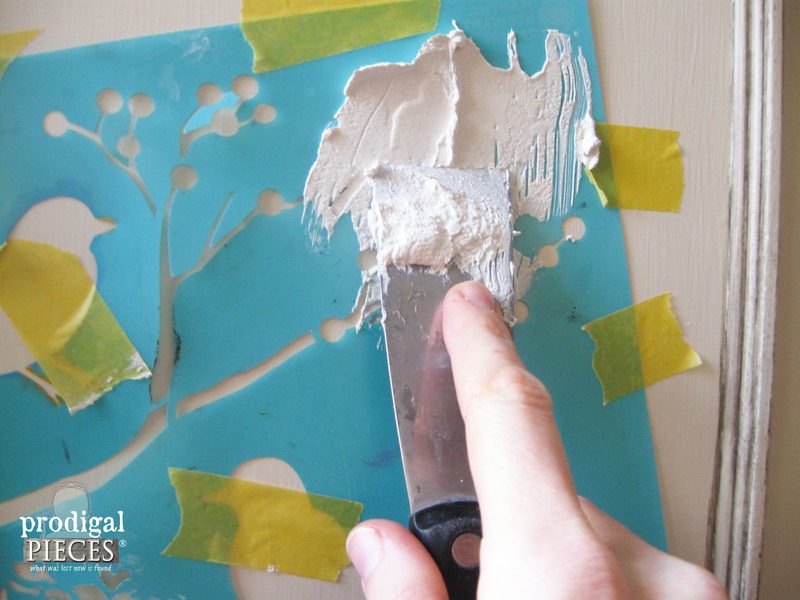 Grab your stencil and tape it in place. 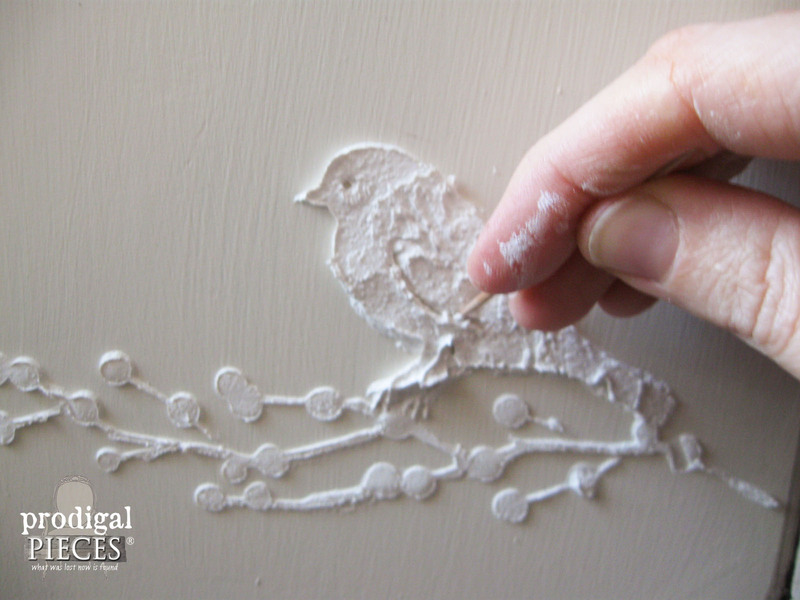 (you could certainly do this before painting, but since this was last-minute, I did it on top) Get a nice chunk of spackling on your putty knife and smear it evenly across the stencil. Carefully remove the stencil by rolling it back towards you and this is what you should see. The best part is that if you mess up, just scrape it off, wipe the surface clean and try again. For added dimension, I used a toothpick to create features in my embossing. Since you will be needing your separate layers to dry before working on another element, I found it best to use a hair dryer to quicken the dry time to about 5 minutes. Once all is dry, you can paint it and even glaze it as I did. Ready to see it all? woot! I am tickled with the outcome and am happy to say this thing is done! I even had an antique glass pull to add to it from my stash. 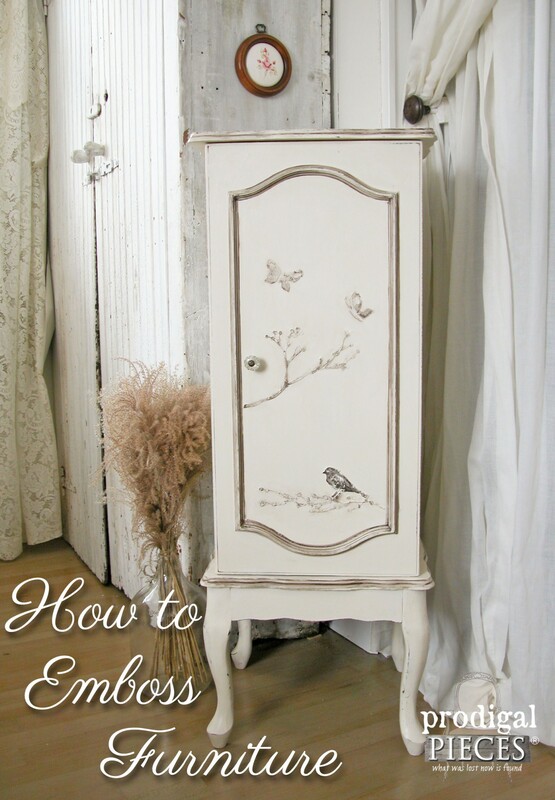 I replaced all the damaged velour with wallpaper, the same one I used on this sewing cabinet, and love the spring-like feel it has. 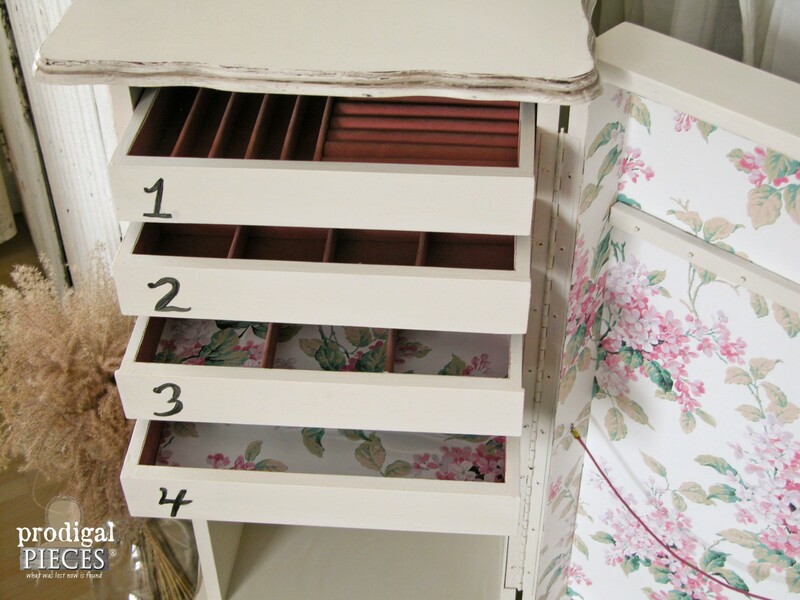 And you have to love the numbered drawer fronts, right? 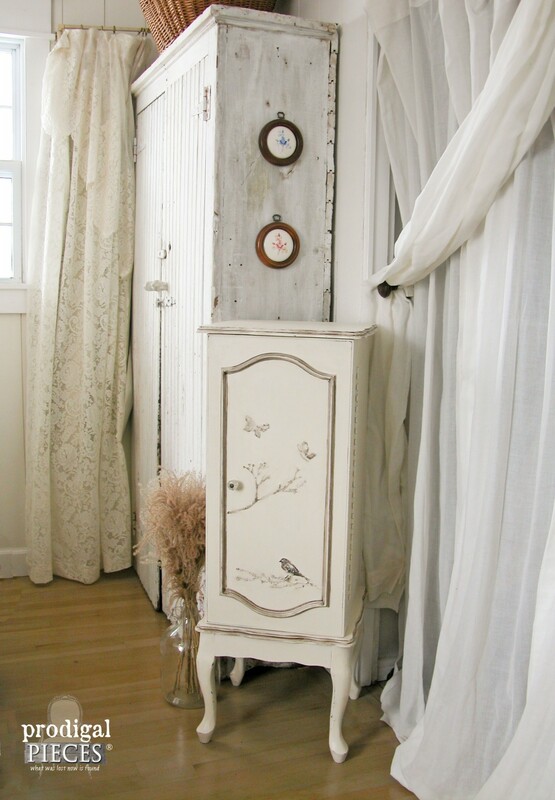 As much as this looks sweet in my master bedroom, I am adding it to my shop (SOLD!). 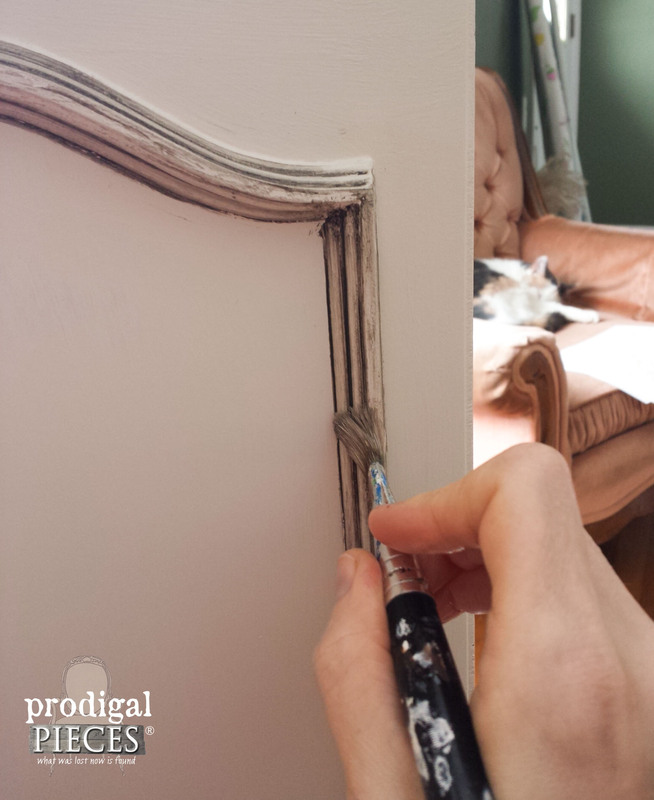 I know that I will be using this method again to emboss furniture, so pin and share so you can find it again. ♥ And…you can certainly do this on most anything! Give it a try – you know you want to. 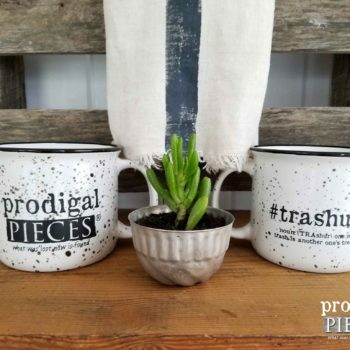 Next week, my blogger friends and I will be sharing our Week 3 of Trash To Treasure Transformations Best of the Archives, so stay tuned! WOW OH WOW OH WOW! That’s amazing! Love every thing about it! hee hee hee…you made me giggle! Thank you! It turned out so pretty. Thank you so much, Debra. I’m glad you think so. Love the embossing! Looks so pretty! Looks way better than before! I just had to have a crack at it and am glad I did. Thank you, Sherry! I’m so happy you like it! Thank you. That is just beautiful. Thank you for sharing. I really enjoy your blog. Makes me happy and smile. Now that made my day, Tracy. Thank you! It turned out great. Thanks for sharing this method with us. I always love to see your finished pieces. 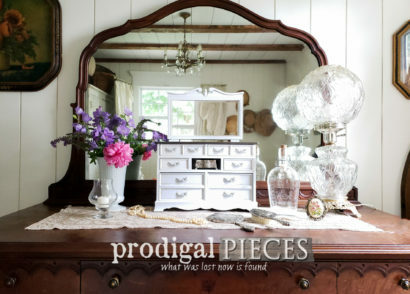 You have great foresight to be able to see the beauty in some of the “before” pieces. I’m always amazed at what you do. Thank you, Janie! I have fun with what I do. Question – do you EVER sleep? Wow, that was soooo pretty! This one is definitely going to Pinterest! You start out with lemons and end up with lemonade! hahaha…good thing I like lemonade. 😉 Thank you, Mary! 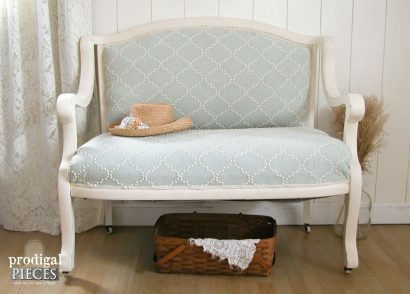 I’ve done that on walls for a boarder, but never thought to try it on furniture!! Beautiful!! It’s amazing how many ways it can be used, isn’t it? Thank you! Your talents are endless Larissa! What was a stressful and unsuccessful trip turned out to be a blessing in disguise because this new piece added to your repertoire, is mahvelous dahling! 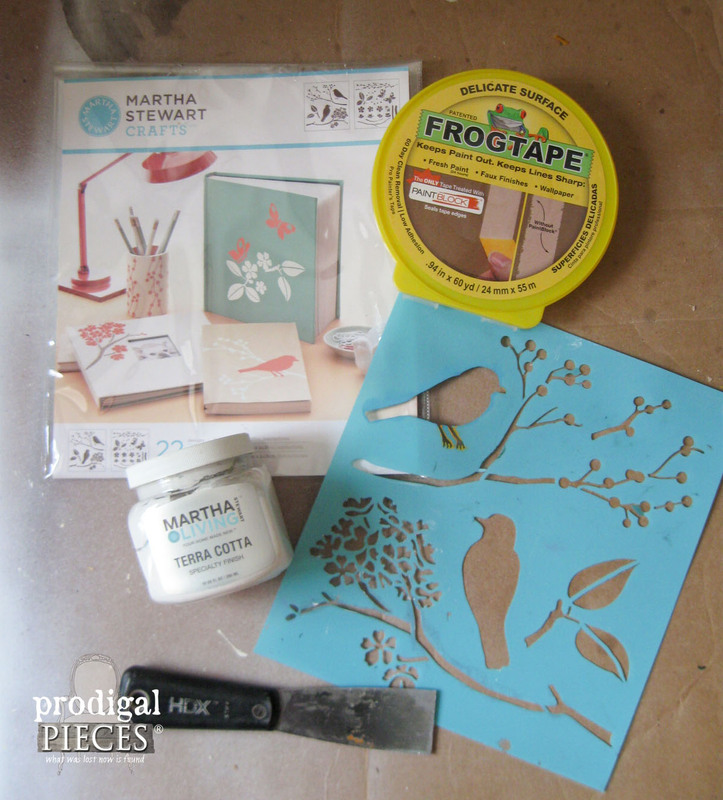 I bought embossing supplies months ago and have been nervous about giving it a try…until now. Thanks for motivating me to give it a whirl. A most beautiful and delicate looking piece! I am wondering how fragile the spackling becomes when dry? Did you ‘set’ it with anything? And as the weather becomes drier do you think that the pattern will hold as made? Hate to be such a worry wart but this is is so beautiful . Gorgeous! I love the texture it adds! You are too sweet, Kathy. Thank you so much! I’m visiting from Hometalk and your piece is absolutely beautiful! 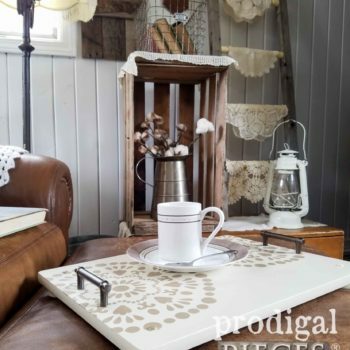 I have used DecoArt Dimensional Effects with a stencil on glass and love the results but never thought about using it on furniture. I’ve also tried spackling on cardboard but found it to crack after drying. Perhaps the cardboard soaked up the moisture allowing the spackling to crack. In any event, your work is beautiful and I love your creative talents! So happy to have you over to my blog. 😀 Yes, I would believe the cardboard aided in the cracking since it is pourous. Thank you so much for you kind words, Gail. Larissa this turned out just beautiful, I may have to try this technique on something soon! You are a magician! Beautiful! I love this project so much. 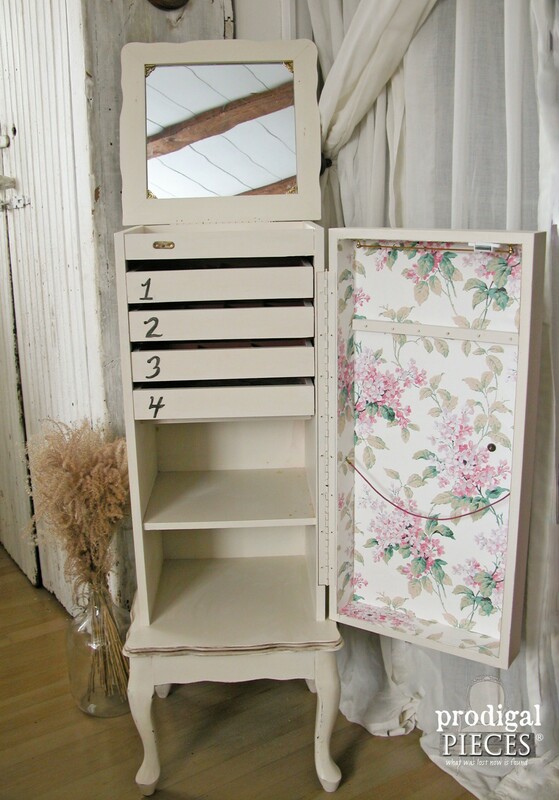 I have a double door jewelry case that is just too Oriental looking for my bedroom decor so I am going to try this with mine. 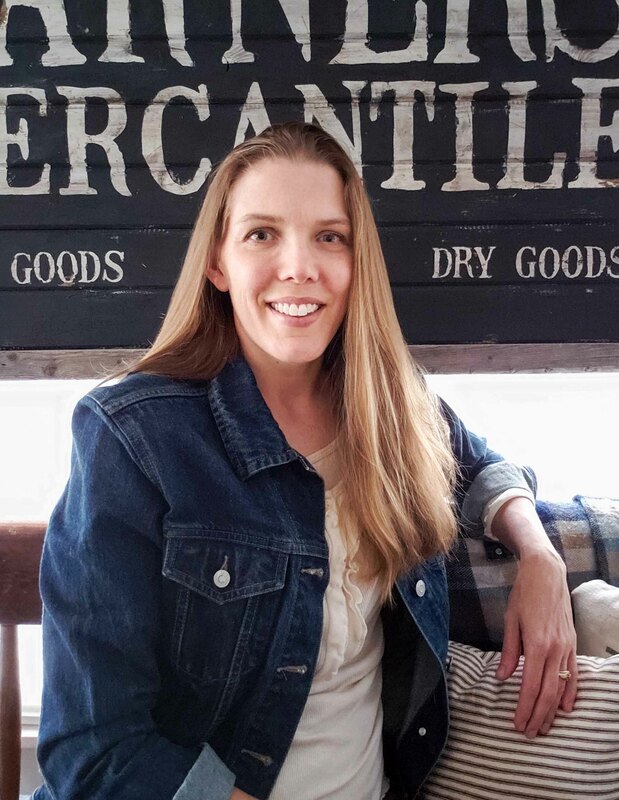 I adore all of your projects, you’ve inspired me to try so many things, and thanks to you my home is looking more and more farmhouse all the time. 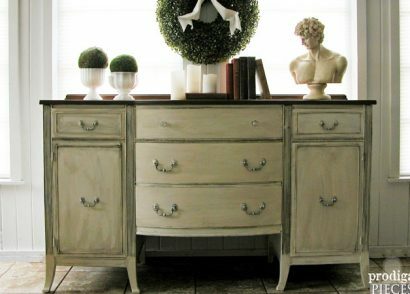 My husband loves it because there is actually less clutter, and I love it because it’s the look I have always wanted! Just sat down to catch up on blogs and saw this jewelry armoire. Stunning! What a beautiful piece it is now. Someone is certainly enjoying it! Thank you for sharing such a neat idea and such a treasure! How fun! I’m happy to hear you are enjoying my work because I truly enjoy sharing. Thank you! I can’t even begin to tell you how much I love this! It is completely awesome. 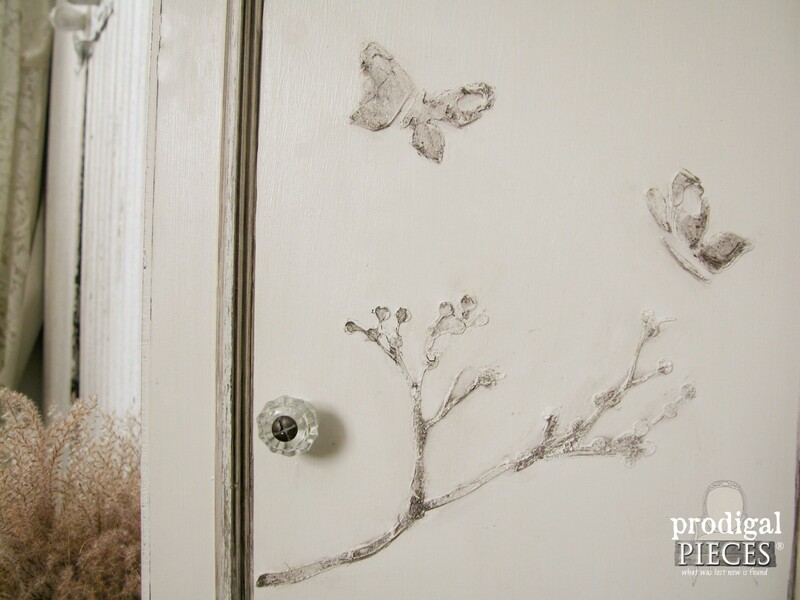 I have always wanted to do this with a stencil. I am definitely going to try it. Beautiful, beautiful piece! How fun to hear, Sharon! I hope you have fun. 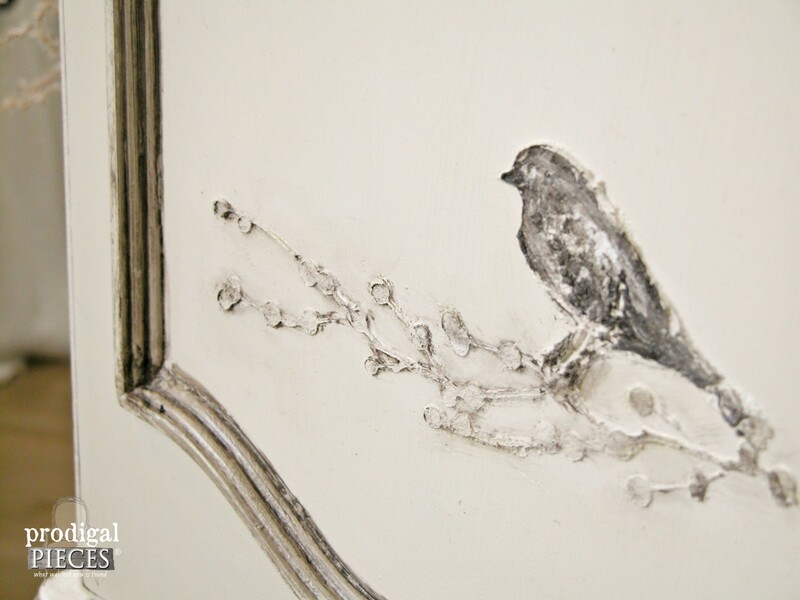 Beautiful…the bird is the perfect touch! !